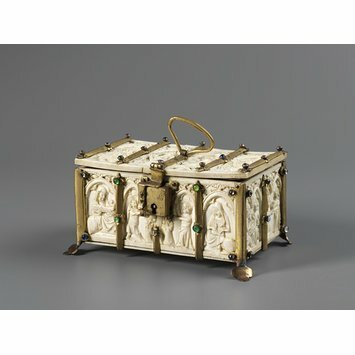 This is an ivory casket made in Paris in the midsdle of the fourteenth century. The casket depicts domestic and couting scenes. Single figures of knights and ladies in conversation, or playing on musical instruments, among them chess players and the lover crowned. The mounts (of later date) are gilded copper set with glass pastes. This example seems not to depict any particular story or romance. Instead the couples depicted make play with the familiar tropes of medieval courtship: hawks, lap dogs, chaplets and games of chess. 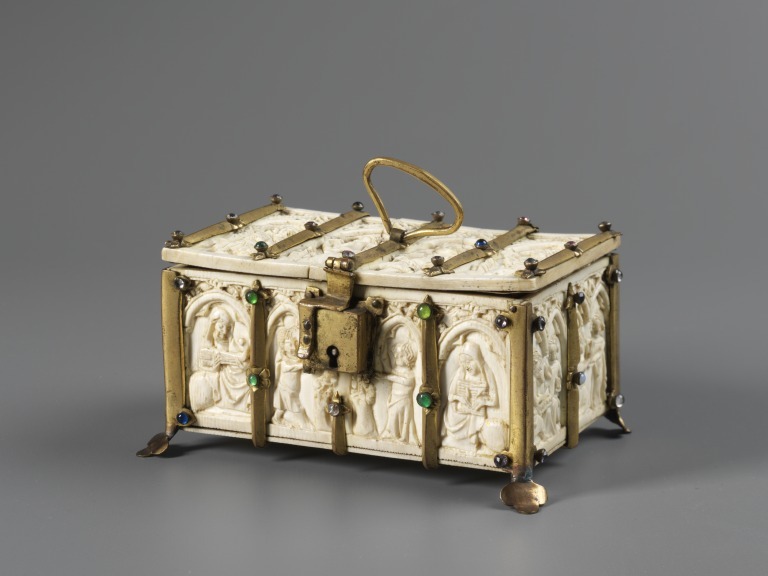 Carved ivory casket composed of six panels depicting domestic scenes. The lid depicts two pairs of male and female figures under trefoil arches. Each arch is topped by a gable with four crockets and a finial; the gable and the spaces to either side of it are embellished with trefoil ornament. The architecture is roughly and unevenly carved. On the left a man with a hawk on his left arm faces his female companion, who raises her right hand towards him. On the right is another man with a hawk, whose female companion holds a flower in her right hand. The scenes around the side of the casket all take place beneath trefoil arches without gables. The front face has at either end a seated musician, playing a citole and psaltery; in the centre, a male and female figure support the lock plate. The remainder of the scenes around the sides of the casket depict pairs of male and female figures. Reading from left to right, the right short end depicts as couple playing chess and a woman crowing her kneeling suitor with a chaplet. The back face shows on the left a seated couple, the woman holding a lap dog, and on the right another seated couple, the woman with a flower. The left short end depicts another seated couple with the woman holding up a small dog, and a seated couple (the same pair?) with the woman grasping her partner's wrist with her left hand while holding her dog with her right. The mounts (of later date) are gilded copper set with glass pastes. In the collection of Prince Petr Soltykoff, Paris, until 1861; bought by John Webb, London, at the Soltykoff sale (Soltykoff 1861, lot 338); purchased from Webb in 1867 for £48.